Adapt based on Mars’ environment – Mars gravity is 38% of Earth. The thinner atmosphere presents greater risk to radiation exposure. Mars has a significant level of sand and dust generated by regular sand storms based on the season. 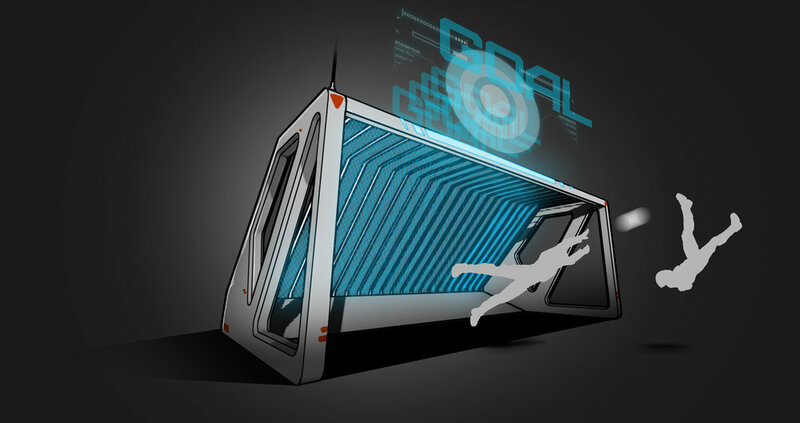 Enhance the fan experience - The game continues to evolve with continuous improvement to reduce time stoppage, enable more spectacular goals, and provide considerations for a more vertical game due to less gravity. Improve game play conditions - Referee-bots improve the accuracy and efficiency of game management – e.g. injured players are quickly carted out by the referee-bots improving player safety and reducing time stoppage. Configurations accommodate the increased velocity, vector, and vertical elements of MAFL. Walls must be constructed of regulation clay. playing off walls – ball is only out of play if it goes over the wall. In place of public seating, stadiums are built to accommodate Spectator Tour Vehicles. Some stadiums have two tiered parking levels. Typical circular stadium design with spectator and club vehicles parking on top side or a 2nd tier. 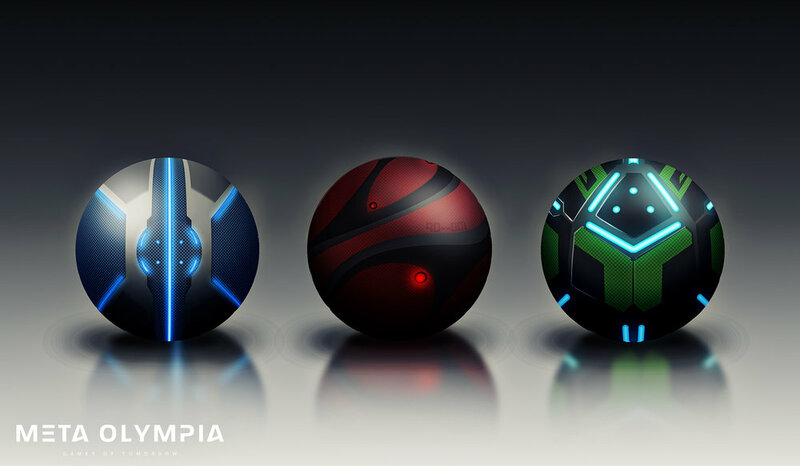 Balls can come in a variety of aesthetic designs. *It is forbidden for Ball systems to engage during regulation play with the exception of passive support (data collection) and referee support (including active play-back and Auto-ball-return functionality). Player considerations have been added to promote naturally, healthy athletes and enable balanced league diversity. A minimum number of five (5) players is required to constitute a team. Teams have the option to forfeit a match if they have less than seven (7) players. Players must be a minimum of 17 years of age, the age of consent on Mars. All-Natural League – Players may not have/use performance enhancing drugs, implants, augmentations. Gravity Training – The use of centrifugal equipment and/or environments that simulate Earth 1g gravity. This is not a restricted form of endurance training in the MAFL. Clubs are permitted a maximum of 60% non-domestic (Earth-born) players. Earth-born players are only eligible with minimum 3 years landed status. Clubs must has have a minimum 40:60 gender mix. Non-binary players must be certified and can be counted wild. EV suits provide life support systems and protect players while providing regulation enhancements for improving playing conditions. Com systems - Hardware that connect to League infrastructure and club close circuit channel is required. *Note: Hacking of equipment, ball or infrastructure is a serious league-level infraction. If referee or online services detects tampering, matches are immediately suspended for investigation. Teams proven of such violation can be suspended, fined or permanently banned. Propulsion systems - fixed CO2 fuel capacity enabling a maximum of 5 full bursts per half. Thrust ports for forward, backward, upward or downward thrust for increased ground or mid-air maneuverability and jumps to top-side. Uniform - players must be easily distinguishing from opposing players and match officials. Lycra layer on top of EV suits is permitted. Direct coloration, decal or embroidery on EV suits is permitted. Helmets - No objects may be affixed to helmets. Helmet glass must be transparent (i.e. tinting is prohibited). Players are not permitted additional eye-wear or other head-mounted devices. Headdress is permitted including Hijab and Turbans. EV Suits are layered and integrate with a tech-pack that contains all onboard equipment, life Support, power and fuel. The above images are free of the lycra (or uniform) layer. Assistants can be human or AI-based officials. All judgement or data from an assistant referee may be overruled by the referee. Games may not end in a draw. After regulation time, the match is resolved on penalty shootouts, called Penalty Kick Overtime. This rule is based on oxygen & radiation exposure regulations to protect player safety. Each team selects their 5 kickers. If, after both teams have taken five kicks, both have the same number of goals, kicks continue until one team has scored one more than the other.